Our team was challenged to solve an environmental problem as part of a First Lego League (FLL) competition. We took on the issue of Styrofoam in landfills. It took many hours of research and many different ideas to come up with a very effective solution. Many people said that recycling Styrofoam could not be done, but with our two products, the EcoBin* and EcoGloo* – we found a way to reduce the amount of Styrofoam in landfills AND recycle it into an eco-friendly product. *EcoGloo now has a U.S. Provisional Patent (Application No. 62/578,163). Our thanks to Poisenelli Law Firm for helping us! We are competing in the FIRST Tech Challenge competition and learning more about robotics. One of our teammates (Reagan) is in 8th Grade and the rest of us have started High School, and are also part of the Lindbergh High Marching Band – and headed to the Tournament of Roses Parade to march! (Maybe some Californians need an earth-friendly glue!?). Watch us on New Years Day as we’re proud to be part of the Spirit of St. Louis band! Guess What??!! We’re In a Documentary! 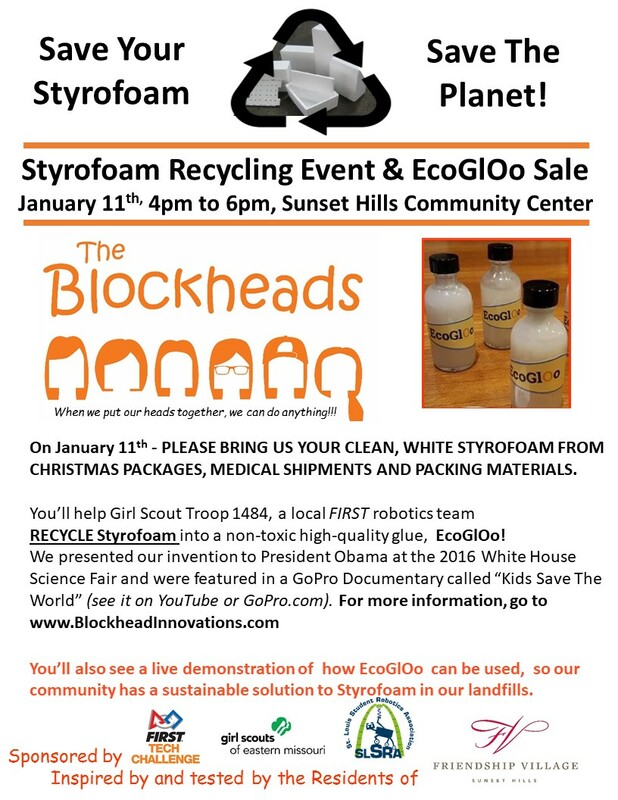 We’re the Blockheads, a group of six Sperreng Middle School students and members of Girl Scout Troop 1484. We developed a unique environmental innovation as part of a FIRST Lego League robotics team and ended up at the 2016 White House Science Fair, presenting our project to President Obama. When we came home, producers at GoPro called our parents and came to St. Louis to film our story. Check it out! 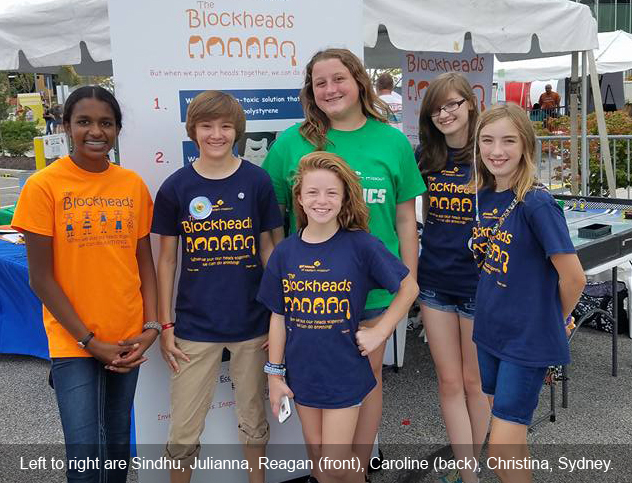 The Blockheads were proud to exhibit at the 2016 White House Science Fair on Wednesday, April 13, which was was broadcast live at whitehouse.gov. We were interviewed by President Barack Obama who tried out our EcoGlOo and said he would follow us on our website! We were able to stand behind him during his press conference about the fair, our fellow student scientists and their projects.